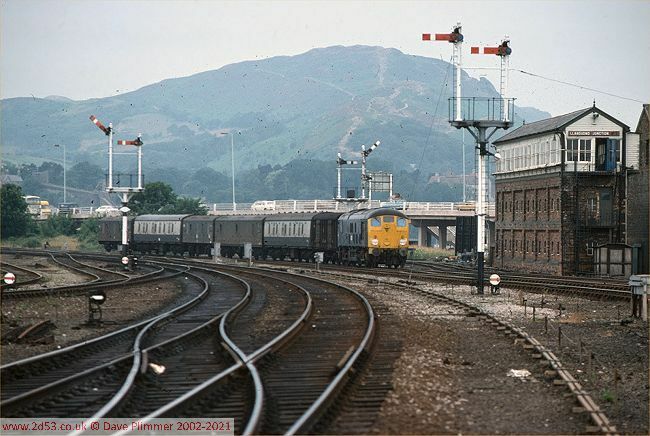 Llandudno Junction was the starting point for a number of local trip freight workings as well as having its own goods yard. In addition, the Up Goods Loop allowed through freights to wait for faster passenger services to pass. 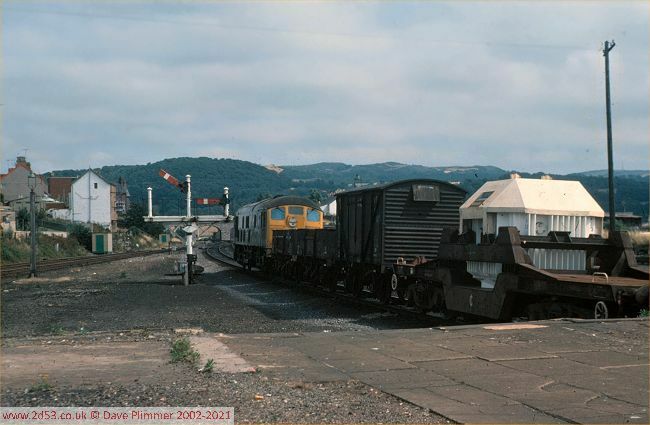 The afternoon freight to Mold Junction departs Llandudno Junction on 27th July 1976, hauled by 24080. Notable is the lack of special treatment afforded to the nuclear flask - just placed with the other vacuum-fitted wagons at the head of the mixed goods train. This train conveyed wagons collected from the trip workings to Holyhead, Trawsfynydd, the morning trip to Amlwch, and from Rhyl and Colwyn Bay collected on a down working earlier. 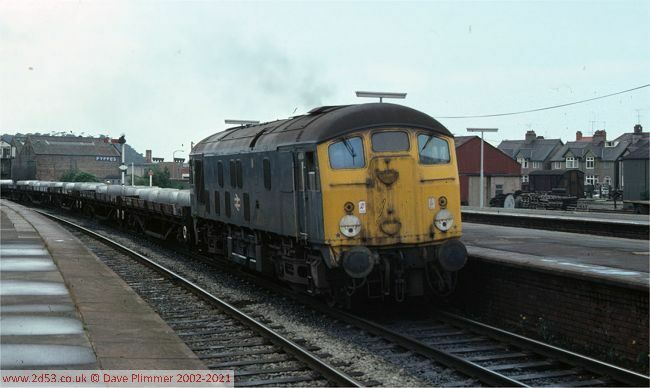 24080 was one of the last of a large number of Class 24s to be withdrawn in 1976, taken out of service on 22/09/76. 24057 arrives at the Junction with the 17:55 Bangor - Crewe parcels and is routed onto the up goods loop. This train only collected traffic at Rhyl, so could be looped here onto the non-platform line. 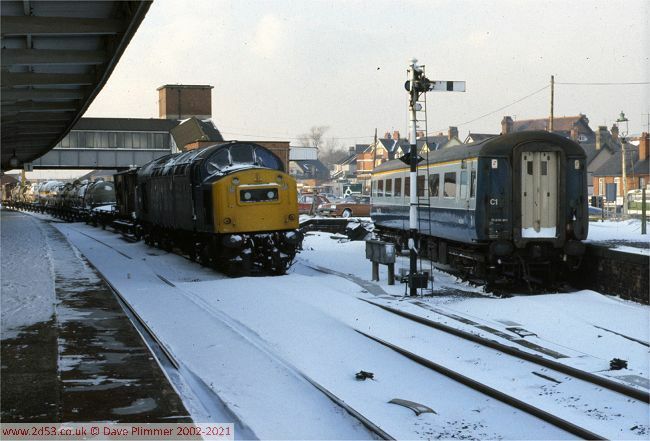 According to the 1976-77 working timetable, this train did not run, but here it is arriving at about 18:10. 15th July 1977. There was no return traffic from Blaenau Ffestiniog or Trawsfynydd on 3rd January 1978, so 24133 returns to the junction on Trip 47 with just a brake-van. The most striking comparison with today's view is the almost total lack of development around the line. 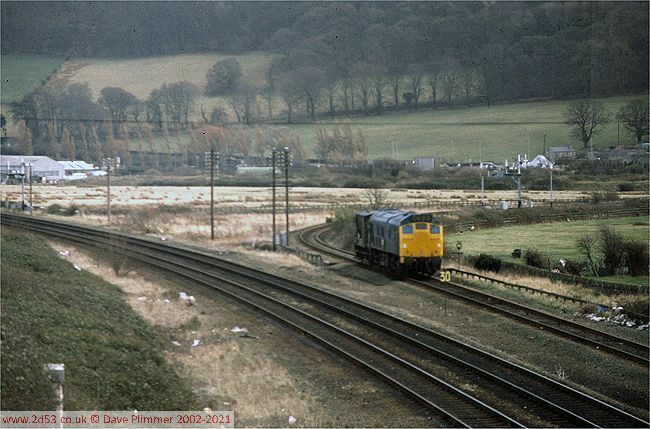 The train is running on what became the connection to the Glan Conwy freight terminal. 24023 runs through platform 2 (now 3) at Llandudno Jcn with a train of aluminium billets originally from Anglesey Aluminium at Holyhead. 24023 is moving these wagons from the down sidings to the up goods loop - a manoeuvre that involved reversals at both ends of the station. 5th July 1978.